People like to talk about beer. This has been true for centuries, but never has it been more true than in the last twenty or so years with the explosion of the craft beer movement. Craft beer, once the province of strange bearded men from mountainous states, has now become a worldwide phenomenon with America, once derided by the various beer cultures of Europe as only producing characterless swill, now leading the world in both quality and innovation. 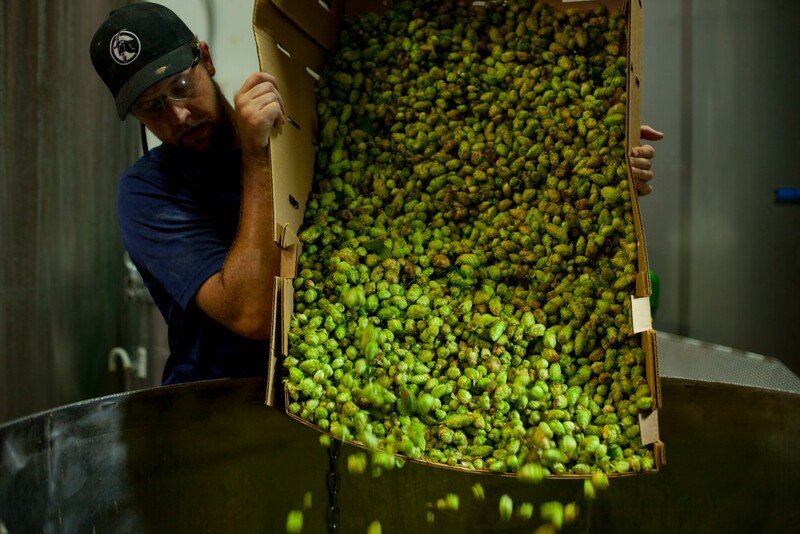 Nowhere in the US is that more true than the northern part of San Diego County, along highway 78, also known as the Hop Highway. 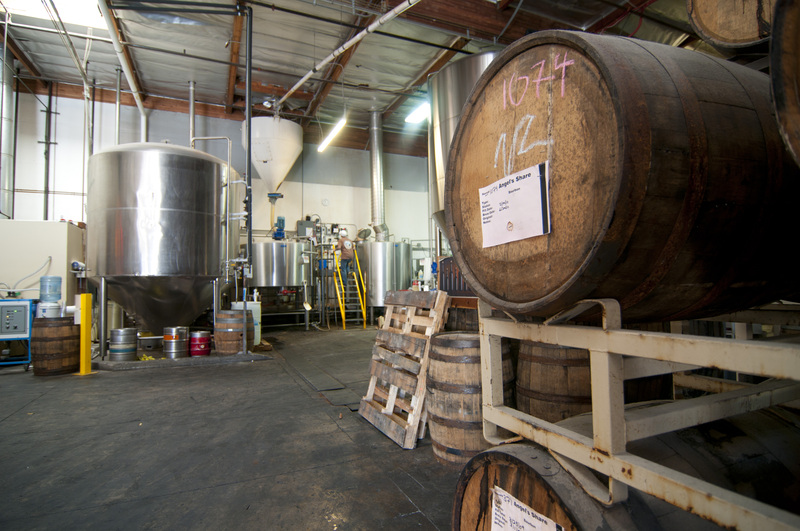 The seeds of the San Diego craft beer scene were planted in 1982 when California enacted a law that would allow breweries to have restaurants on their premises. 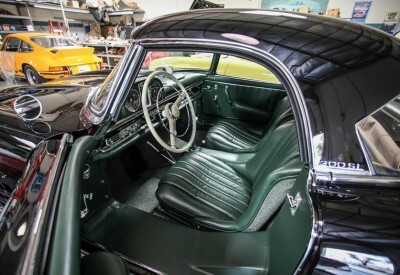 It wasn’t until 1988 though that two friends, Chris Cramer and Matt Rattner, reached out to Cramer’s cousin Karl Strauss, then a Vice President at Pabst Brewing, and asked for his help in opening what would be come California’s first brew pub. Karl Strauss Old Columbia Brewery and Grille opened in Downtown San Diego in 1989 and was the first brewery to operate in San Diego County since 1953. The success of Karl Strauss would open the floodgates for many other brewpubs and breweries. Pizza Port started in 1987 as a humble pizza restaurant in Solana Beach, CA and was instrumental in propagating the nascent craft beer scene in San Diego County. After the success of Karl Strauss’ brewpub, they installed a 7 barrel brewery of their own and began serving their own beer in 1992. 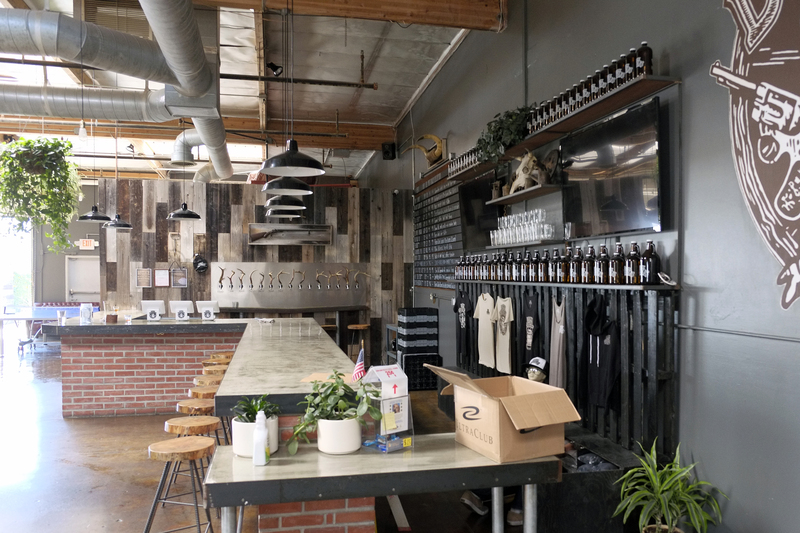 In 2006, the owners of Pizza Port spun off their brewing operation into Port Brewing Company and The Lost Abbey, based in San Marcos, CA and it’s here that we truly begin our tour of the North County craft beer scene. 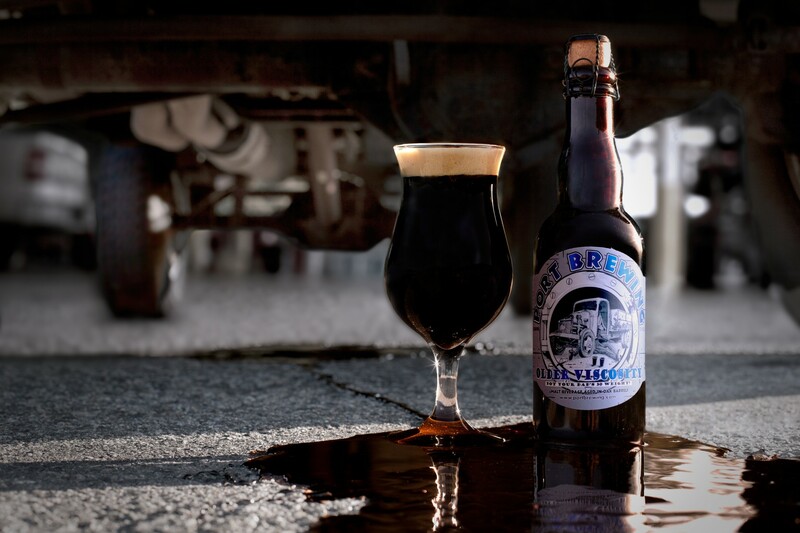 Port Brewing Company and The Lost Abbey are currently housed in the former Stone Brewing facility in San Marcos in an unassuming business park that houses brewing operations, barrel storage for aging and a popular tap room. 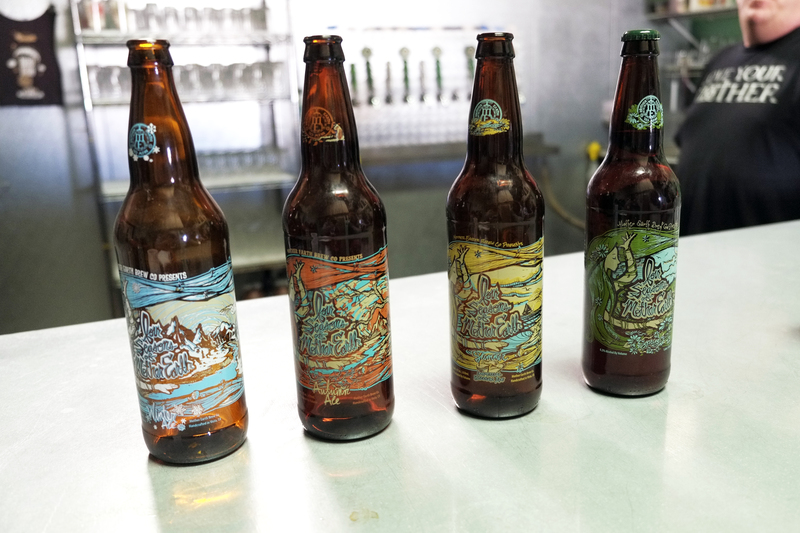 Port Brewing produces five year-round beers including their popular Wipeout IPA and Hop-15 seasonal double IPA. The Lost Abbey line is comprised of Belgian-inspired ales like their Devotion Belgian blonde ale and their Red Barn spiced saison. Both brands are very well regarded, with The Lost Abbey in particular winning countless awards for their beers. Both brands are firmly entrenched in the minds of beer drinkers and have been successful in terms of sales. Their reputation preceded them, and it was with high hopes that we pulled into their small parking lot and walked into their brewery. 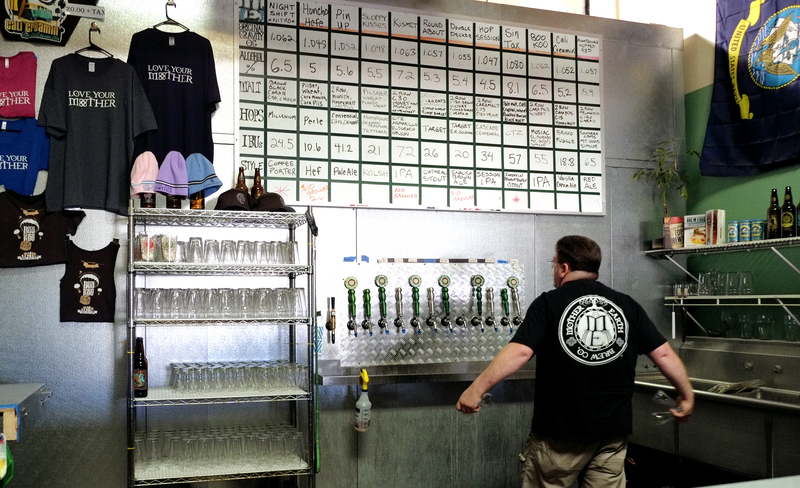 The first thing that is apparent upon entering Port Brewing Company is how incredibly popular their tasting room is. The place was absolutely packed with people standing around, talking and drinking. There is no physical divider between the tasting/taproom area and the brewery proper. Huge stainless tanks and pipes run everywhere. This is a big operation. We meet our tour guide Adam Martinez, Director of Media and Marketing, he gives each of us a pair of safety glasses, and leads us through a metal rollup door and into the bottling area. 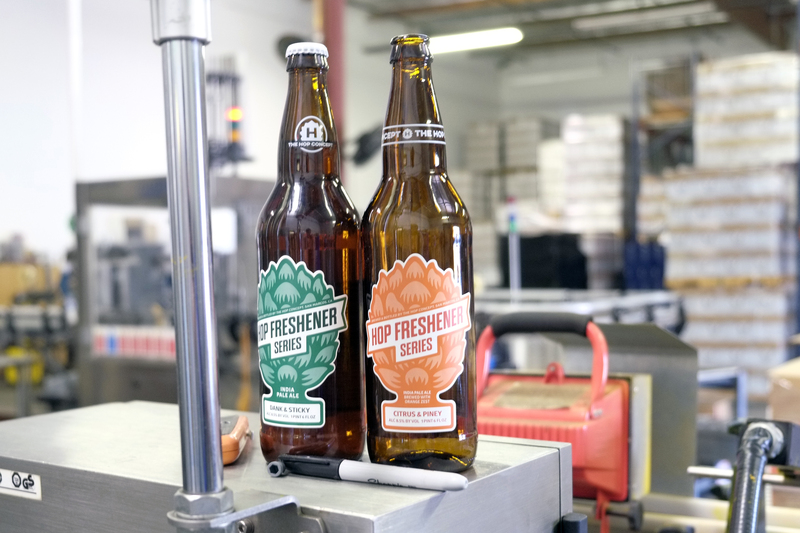 Here he gives us a brief overview of the bottling line and tells us about the company’s newest line, Hop Concept. He speaks about the company’s growth from year to year, and takes us to the Lost Abbey barrel aging room. 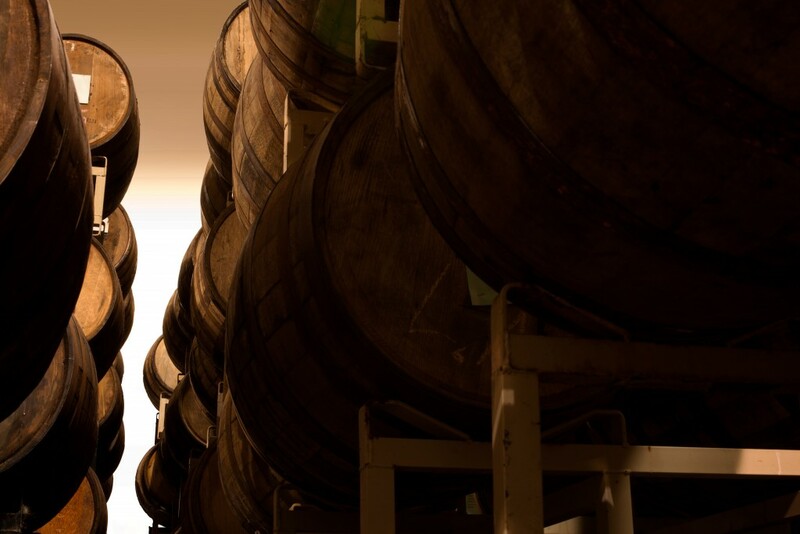 Here, hundreds of bourbon and wine barrels sit on racks that stretch from one end of the room to the other, and nearly to the ceiling. The scale of everything is impressive. The one thing that strikes me as we are led through one of the best breweries in the country is how serious it feels. This is a big business and it is run as such. That may come off as disparaging, but producing something as delicate and complicated as beer at this scale requires that kind of attitude. All of their hard work clearly pays off, a fact which is only cemented by our brief stop at the taproom for pints. 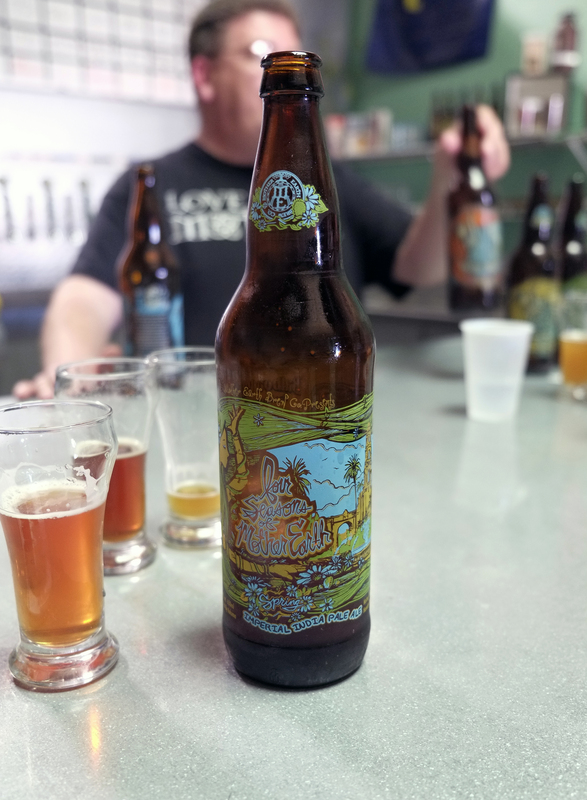 For every Lost Abbey, Stone, or Ballast Point, there are ten or twenty smaller breweries trying to make a name for themselves in a crowded market. 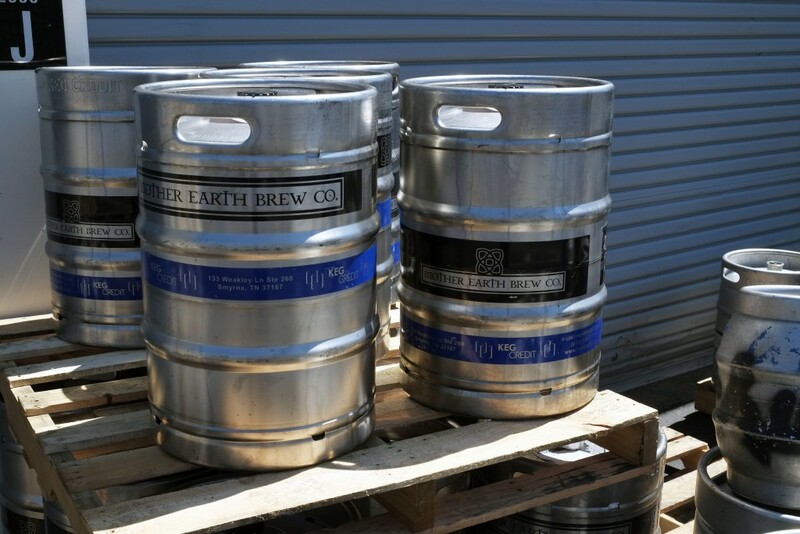 One of those, and perhaps one of the best, is Mother Earth Brew Co. in Vista, CA. 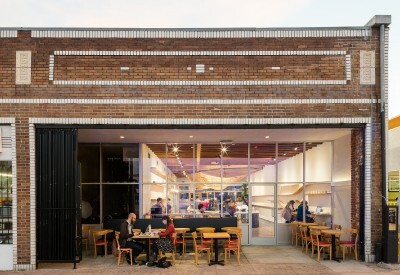 Much like Port Brewing and The Lost Abbey, Mother Earth occupies several spaces in a business park in Vista though the extremely low-key exterior gives no clues as to the wonders contained within. As soon as we arrive at Mother Earth, we are greeted by Kevin Hopkins, Mother Earth’s Chief Branding Officer. Within the first five minutes of meeting Kevin, it’s apparent that this man is doing what he loves. In fact, that sense of passion and pride courses through every inch of Mother Earth, from the guys running the canning lines all the way through to the brew-master. We began our tour in their new canning facility. Thousands of cans of their delightful (read: dangerous) Cali Creamin’ cream ale were snaking their way through production and being stacked neatly on pallets for distribution. From there we were led through the main brew house and into grain storage and the hop cooler where we were handed several varieties of pelletized hops, including Nelson and Mosaic hops, the scent of which we were asked to remember. From there it was cold storage and then the tasting room. To say that Mother Earth were generous with their wares would be an understatement. Our samples began with the sweeter fare such as Cali Creamin’ and their Sin Tax peanut butter imperial stout (made with a peanut tincture, rather than solids and as such is billed as being non-allergenic), both of which are combined to form the “Cali Tax”, their unique take on a black and tan. Next we sampled their extremely popular Boo Koo IPA and it was immediately clear why we had been asked to remember the smell of the Mosaic hops, as this beer smelled exactly like them, and I do mean exactly. It was uncanny. Your author will admit to being somewhat IPA-averse, preferring big Belgian tripels and funky saisons to the piney, resinous IPAs that San Diego is best known for and as such I approached this beer with some apprehension. I was completely blown away by the fact that not only was it not absurdly bitter, it was delicious and imminently drinkable. Boo Koo is one of the best beers I’ve ever had. From there we stepped up the hops with their Kismet IPA and its pungent Nelson hop character, again instantly recognizable. When asked about their philosophy on brewing, Kevin says, “We try and brew simple beers that show the drinker that the way we make beer is solid. We’re also proud of the fact that we’re much larger than people think we are and that now the world market is demanding beers from Mother Earth.” It’s clear that if Mother Earth keeps making beers like these and growing at the rate that they have been over the past few years, it won’t be long before they’re mentioned in the same breath as San Diego staples Stone and Ballast Point. So, there are the big microbreweries like Port Brewing Co and the mid-tier breweries like Mother Earth Brew Co, but what about the even smaller operations, how do they fit into this equation? Well, North County is full of them, breweries that don’t bottle, definitely don’t can, and some of whom don’t even distribute outside their taprooms. 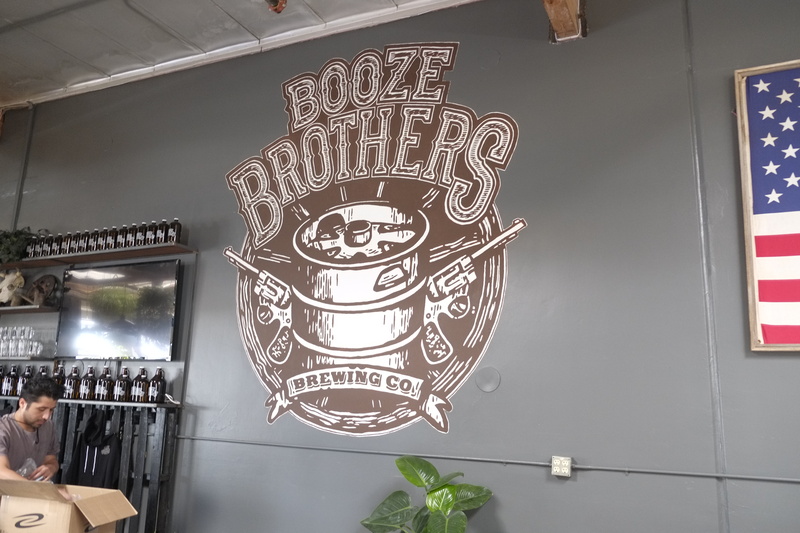 To get a better feel for their place in the community we sought out the Booze Brothers in Vista. The Booze Brothers set up shop in, that’s right you guessed it, a business park in Vista in 2013. Dave and Donny Firth were born in Sweden, but have called Vista home for more than 20 years. 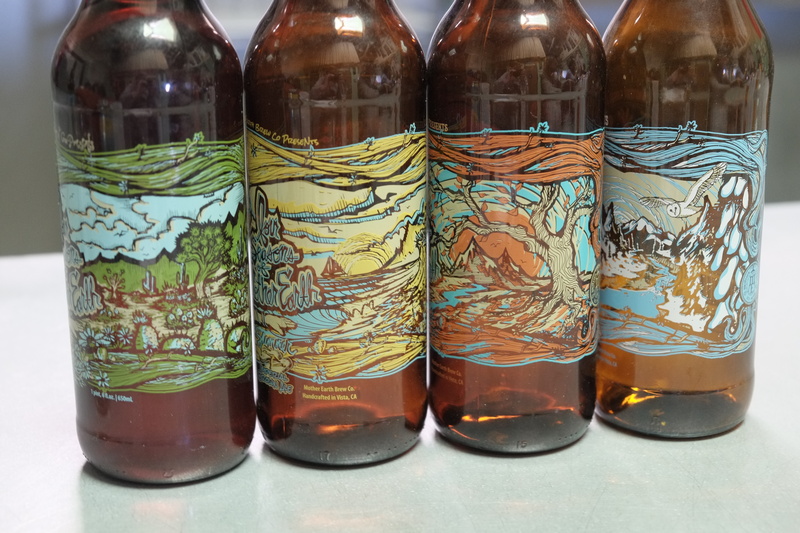 Donny started brewing in 2009 in order to provide beer for his sister’s wedding. He found that enjoyed the process (and the end result) and started brewing five gallon batches weekly with a roommate. When the roommate moved out, Dave stepped in and learned the ropes. Their weekly five gallon batches turned into ten gallon batches and then twenty gallon batches, and so on. They were given the name Booze Brothers by family and friends after they began serving their home brews out of their parent’s garage. Eventually, they decided to try brewing as a business and with their parents’ help, they were able to find and secure their space in Vista. If the guys at Mother Earth were different from the guys at The Lost Abbey, the Booze Brothers are from a whole other planet. Dave Firth welcomed us to the taproom which was in the midst of being prepared for a wedding. He started by leading us to their outdoor space and back bar and pouring a round of their nitro coffee porter and we talked a little about how he and Donny got started. Dave is the quintessential easygoing San Diego hesher type, constantly cracking jokes while wearing a huge smile. He led us on a tour of their brewing facility, explained their plans for expansion into the next space over from them. He talked about the decor for their facility, how his sister had done most of it, and laughed at how he and Donny were constantly having to veto her choices because her taste veered towards the cute and “Pinteresty”. We made our way back inside to the main bar and began our tasting in earnest. Donny and Dave brew what they like, whatever they’re feeling at the moment and that makes for a pretty varied selection of drafts. They brew everything from porters and stouts to IPAs and witbiers to mead and kombucha. 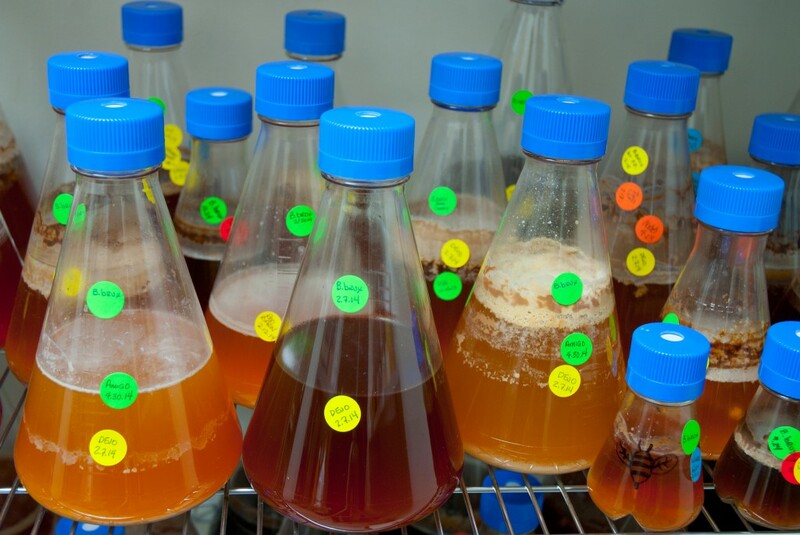 To the uninitiated, kombucha is a fermented beverage made from yeast, sugar, tea, and bacteria. It’s very sour, but the blonde ale that the Booze Brothers mix theirs with mellows it out and turns it into a kind of new age sour ale (in spirit anyway). Dave and Donny are in their early ‘30s and it’s clear that they’re living their dream. Their excitement is palpable and easy to get swept up in, and the taproom is a space you want to be in with its rough wood and comfortable vintage sofas. These guys are clearly the future of the industry. They’re young, passionate and smart and they have the talent it takes to stand out in a community of excellent brewers. Plus, you have to love that their water tap for customers is operated via a Budweiser taphandle, a dig at the brewing giant’s Superbowl commercial which mocked the craft beer movement and its adherents. 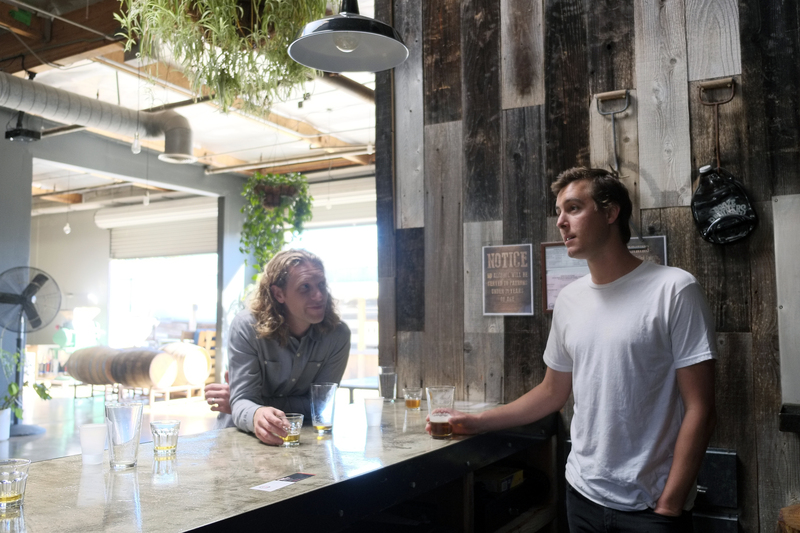 Our time in North County proved interesting and seeing three businesses in the same industry at different stages of development really helped to give us a complete picture of the thriving beer culture there. We tasted dozens of staggeringly delicious beers, met some incredible craftspeople who are working day and night to improve their skill set and push the envelope when it comes to what can be done with water, grain, hops and yeast. In what amounts to a relatively short amount of time, the San Diego brewers have inexorably changed the world’s beer landscape, and I’d say it’s for the better. I, for one, can’t wait to make the trip back down and see what they’ve come up with next.